Blood Suckers Video Slot Guide & Review - Casino Answers! Blood Suckers is a 5-reel, 25-line video slot developed by Net Entertainment, featuring a wild symbol, scatter wins and a bonus game. You can play the Blood Suckers video slot at Bovada. Coin values on the Blood Suckers slot machine are $0.01, $0.02, $0.05, $0.10, $0.20 and $0.50. You can bet from 1-4 coins (or “Bet Levels”) and select from 1-25 paylines per spin. The lowest total bet you can make on the Blood Suckers video slot is a penny per spin, with the highest being $50 per spin. Blood Suckers is an excellent choice for casual slots players. You can manually skill stop the reels during a spin by hitting the Spin button during a spin, bringing the reels to a complete halt. To play Blood Suckers with all four coins and all 25 lines enabled, hit the “Bet Max” button. To play all other wagers on Blood Suckers, simply hit the Spin button. The highest paying symbol on the Blood Suckers online slot is the Dracula Biting symbol. If you hit 5 of a Kind on a selected payline, you will win the 7500 coin top jackpot. The Dracula Biting symbol is the wild symbol on the Blood Suckers video slot and will substitute for all symbols except for the scatter symbol and the bonus symbol. The Vampire Bride symbol is the scatter symbol on Blood Suckers. If you hit 2, 3, 4 or 5 scatter symbols anywhere on the reels, you will win 2X, 4X, 25X or 100X your total bet. Also, three or more Scattered Bride symbols will win you 10 free spins with a 3X multiplier. The free spins feature can be re-triggered. Prizes won in bonus games will not be multiplied. Win cash from the Blood Suckers free spins feature when you play it at Bovada! Winning combinations and payouts are made according to the Paytable. Payline wins are multiplied by the bet per line. Wild symbol substitutes for all symbols except scatter and bonus symbols. Scatter wins are multiplied by the total bet. Scatter wins are paid independent of bet lines selected. Only the highest win per active payline is paid. Payline wins pay if in succession from left to right. Simultaneous wins on different paylines are added. Blood Suckers has an autoplay mode that can be opened up by hitting the “Auto” button. You can play 10, 25, 50, 75, 100, 250, 500, 750 or 1000 autoplay spins at a time. In the advanced settings, you can set Blood Suckers autoplay mode to stop on any win, if free spins is triggered, if the jackpot is won, if a single win exceeds (any amount you input) and if cash increases/decreases by (any amount you input). You can stop the autoplay mode at anytime on the Blood Suckers slot game. Blood Suckers gives you everything the average slots player is looking for in a video slot. It has a bonus game, a free spins feature with a good multiplier as well as a more than satisfactory top payout. Net Ent also gets points for giving it a darker theme, as it seems slots tend to go for the more comical feel more often than not. To play the Blood Suckers video slot, sign up and make a deposit now at Bovada. 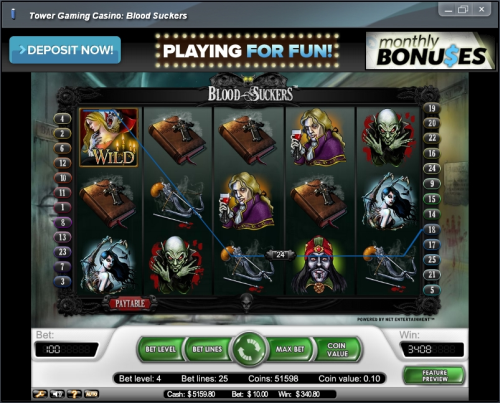 Can I play a free Flash game of the Blood Suckers online slot? 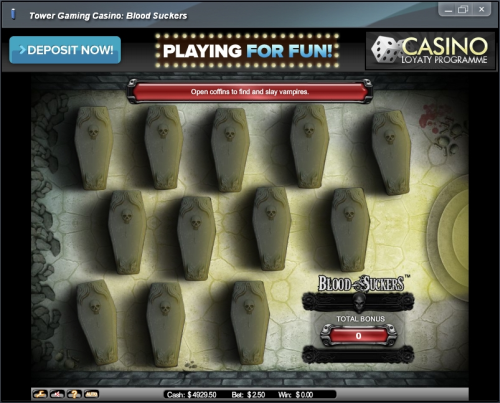 You can play a Flash game of the Blood Suckers video slot right here at Casino Answers! You can find the Blood Suckers Flash game in our Flash games section. If you come across any difficulties playing the Blood Suckers Flash game, make sure you have the latest version of Adobe Flash Player installed on your computer. Can players from the United States play Blood Suckers for real money? American players cannot play the Blood Suckers slot game for real money at this time. For a couple of Halloween video slots you can play, you can check out Scary Rich and Scary Rich 2 at Rockbet Casino or read our Rockbet Review. If you can’t get enough of vampires and want to read more Halloween-themed slot game reviews, please read our list of Halloween slots.